"The Reluctant Dragon" was published in 1983 as a children's book. The story came originally from Kenneth Grahame's collection of short stories Dream Days, published in 1898. The book edition is illustrated by Michael Hague, who also illustrated publications of The Wind in the Willows, also by Grahame, and The Secret Garden, authored by Frances Hodgson Burnett. The publisher was Holt, Rinehart, and Winston. I found this grand book at our local public library. 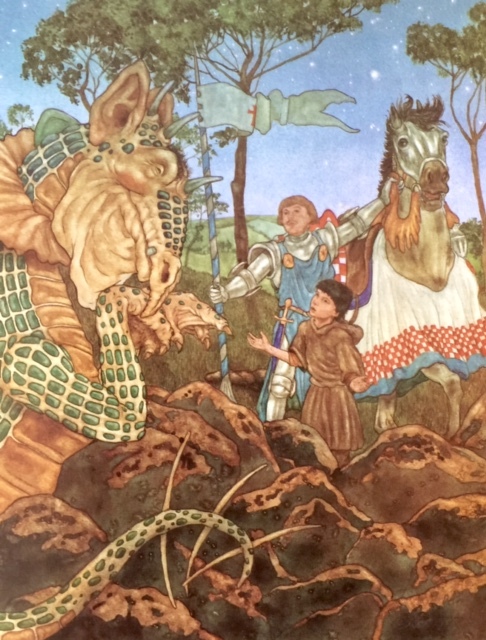 The tale is one full of whimsy about a lazy and easy-going dragon, a boy, and St. George. For children (and for adults who need the learning), the lesson is that differences can coexist, and that it's a lot more pleasant getting along than fighting. A secondary lesson is that reading and scholarship can be useful. Michael Hague's illustrations are lush and full of medieval extravagance. Children can view them and not be bothered with all the realism that Chaucer chose to include in the Canterbury Tales. The colors are gilded with the aura of times gone by, and the detail just begs for taking the time to look closely. Hague's romanticism and lightness also lend themselves to a dearth of realism. For instance, the Boy reads in a bedroom entirely too elegant for a shepherd's soon, both in size and decor. 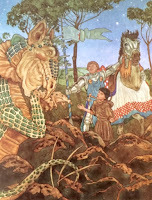 Also, although perhaps appropriate for a children's story, the dragon is not, as it states, one of the earnest dragons. 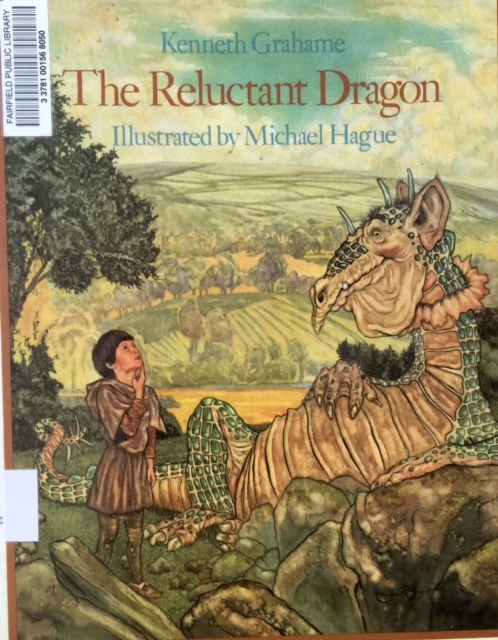 Hague's illustrations paint the dragon as entirely avuncular. That's the only word that fits. This book, though, is a friendly tale filled with humor in both text and illustration. It's a world any child or adult can enter, and upon leaving, exit with a light step and a happy heart.